In something of a first for Io Interactive's Hitman series, the last game didn't end in such a festival of murder that there were no loose ends for a sequel. Hitman 2 picks up where the last game left off, though this time out we're getting a full game's worth of content right out of the box instead of an episodic structure. 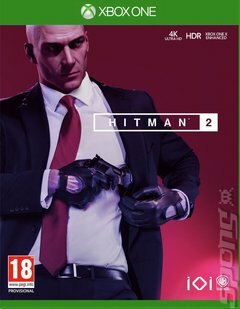 The Hitman series is all about embracing your creativity and problem solving skills to kill people in as imaginative a way as you can conjure up. Io has pushed the formula further than last time, with bigger stages that offer lots of moving parts for you to play with and a lot of accidents just waiting to happen. Sneak around stages like a race track in Miami, the Columbian stomping ground of a drug cartel, Mumbai, Hawke's Bay and the mysterious Isle of Sgàil in the North Atlantic while you try to off your target as inconspicuously as possible. The briefcase makes a comeback, meaning you can bring bigger weapons such as sniper rifles to your mission, but you can just as soon murder a target with a weaponised donut as with a high power rifle. This time out players also get the option of using concussive gadgets to render enemies unconscious if they fancy taking their body count down a notch or two. The biggest addition, though, is a new cooperative multiplayer mode called Sniper Assassin. Players can team up to take out enemies using a sniper rifle within a set time. As well as Agent 47 players can settle in behind the sights of Knight and Stone, each of whom has access to specialised ammo types. It doesn't stop at release day, either. There will be time limited 'Elusive Targets' missions with Sean Bean portraying the first future victim and additional levels also planned.